Madhya Pradesh Tribal Museum. I am serious when I say this: It was one of the most beautiful places I have ever been. Again, I had breakfast with Mrs. Mukherji. We talked about some of the fourteen countries she has visited. She told me about the fire blossom trees in Cairo. In the summer, on the street she lived on, there were these explosions of colour, red flowers on all the trees. Piyush came to get me. Yay for motorbikes. Somehow I’m much less afraid to be on one than I should be. I think the large helmet helps. Pradeep and I talked through yesterday’s work. He suggested that instead of just being given problems to work on, MSIL students could select an area and then go on a walkabout of sorts – meeting stakeholders, asking questions and really observing. Field trips for big kids, I guess. I liked it. Then we continued discussing how to make the Museum School more inclusive. It took some back and forth, but we ended up narrowing the problem down to building bridges. How can we build in ways for students with different abilities to communicate? My ‘bridge’ language of pictures and gestures is one example. Pradeep makes a distinction between problems that have solutions and problems that have become “ways of life.” I asked him whether a “way of life” can be changed. It’s not so easy, he told me, because everyone becomes a stakeholder in the problem so everyone is a stakeholder in the solution. As an example, he talked to me about corruption in India. I was surprised where he went with the topic. He (well, we – he kept asking me questions) suggested that what is keeping the system of corruption in place is a lack of self-confidence and resilience on all levels. People have started abiding and adjusting rather than struggling against the system. I was back at the Museum of Mankind today. The students and I taught each other about sculptures and the colours of the rainbow. They asked to see pictures of my family. They also asked me if I prayed. When I told them “No,” they were shocked. “Why?” I thought for a minute, then shrugged helplessly. Sometimes pictures and gestures fall short. At the end of ‘school’, Shibani asked me if I wanted to see something interesting. I am programmed to say “Yes!” in these kinds of situations, so off I went. We went up a staircase and into an old library. We met with one of the senior guides of the museum. He was surrounded by plastic bags full of pieces of broken pottery. He passed them around. Some, four thousand years old, had deer painted on them. I thought about the people who had made these pots. I realized that I wasn’t quite sure how pottery was made. I also wondered what archaeologists will find of our civilization years from now. Lots of plastic bags? Shibani asked me if I wanted to see something interesting. I am programmed to say “Yes!” in these kinds of situations, so off I went. The cultural education of Brianna Smrke continued when Shibani took me to the Madhya Pradesh Tribal Museum. I am serious when I say this: It was one of the most beautiful places I have ever been. The story is this: the museum is meant to celebrate the rich heritage of the many different tribes of Madhya Pradesh (the state I am in now). It was a collaborative effort between members of these tribes and curators. 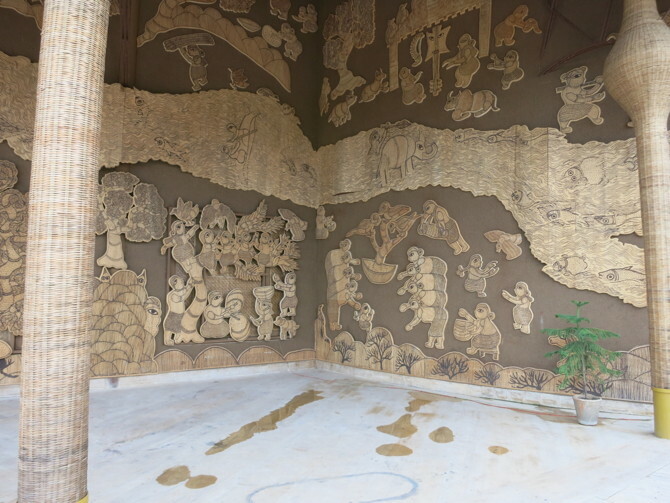 Art installations were specially made by traditional artisans for the sprawling 2 acre (?) complex. One interesting aside: the price for Indians is 10 rupees (20 cents) and the price for Foreigners is 100 rupees (2 dollars). It was a government funded project, so maybe it came out of taxes? The tribal museum stood apart from the skin whitening creams and English signs and Westernized clothing I’d been seeing everywhere. Another face of India, I guess. This entry was posted in Stories and tagged bhopal, museum, oasis. Bookmark the permalink.